Dual adjustable arms lift a separate worksurface (not included) with outstanding strength and stability, creating a premium sit-to-stand workstation. Slim, Low Profile Design - BIFMA tested for strength and human factors criteria. Model #2420 - 12.5" height range adjustment has been developed to work in conjunction with our Sonoma Series™ height adjustable work centers. Optimal for adjustable height work surfaces. Available in five widths from 20" – 39"
Versatility Meets Your Needs - Specific keyboard platforms can mount directly to Gemini models. Keyboard platform adaptor is required. 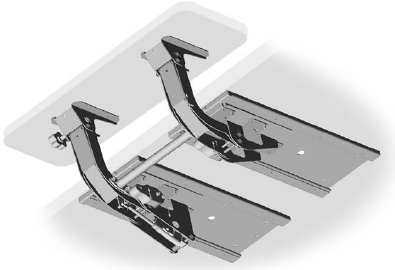 Thin Glide Slide Kit allows arm to store underneath work center. Gemini Arm Platform Adaptor - Mount WorkRite keyboard platforms directly to a Gemini arm. Three Models For a Custom Fit - Adaptors available for 20", 23" and 27" wide Gemini arms. 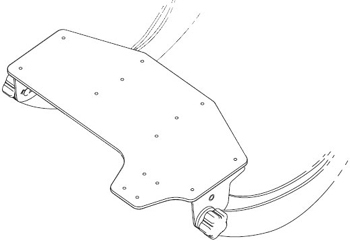 Easy Installation - Mounts directly to Gemini, then platform mounts quickly to adaptor. Gemini ThinGlide Slide Kit - Slide your dual arm-mounted keyboard platform under your work center. Easy Keyboard Platform Storage - Allows entire keyboard platfrom to slide under workcenter for increased non-computing workspace. ThinGlide Track for Easy Movement - Ball-bearing slides provide effortless adjustment.